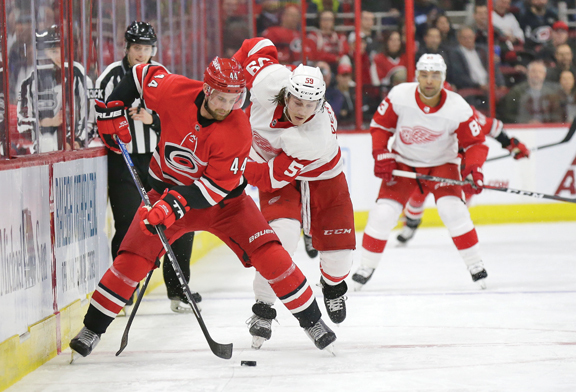 RALEIGH, N.C. (AP) — Badly outshot over the first two periods, the Detroit Red Wings still managed to have the lead and went on to another win. Niklas Kronwall had a goal and an assist, Jonathan Bernier stopped 38 shots and the Red Wings beat the Carolina Hurricanes 4-1 on Thursday night. Bernier had 14 saves in the first and 12 each in the second and third periods. “I thought I was there when they needed me, especially in the first, to weather the storm,” said Bernier, who denied Carolina’s top goal-scorer, Sebastian Aho, on an early breakaway. Carolina had a 27-13 advantage on shots on goal through 40 minutes. “We can’t be sitting here relying on an 18-year-old to get it done,” Hurricanes coach Rod Brind’Amour said. A Carolina shot with 5:35 left rolled off a skate and past Bernier, but Filip Hronek swept it off the goal line, and Detroit retained its 3-1 margin. “We’re just inches away from doing the right thing all the time,” Martinook said.